You can find search appearances right below your header section of your profile. 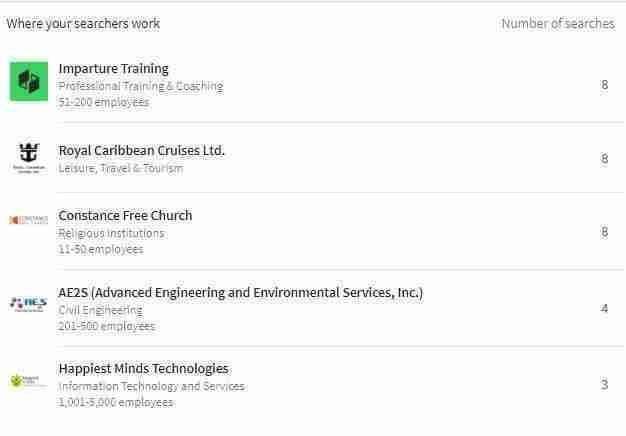 This new LinkedIn feature offers you clues into learning how people found you in a search. 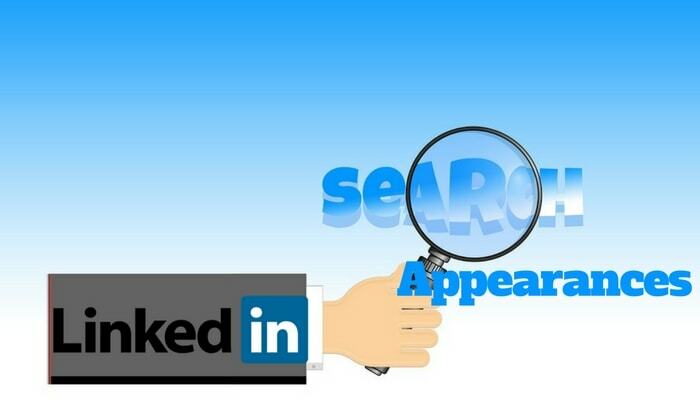 From your profile on both mobile and desktop see how many people found you on a LinkedIn search. You can also see the companies and job titles of the people who found you in search to help signal what types of opportunities you may be a fit for. Click through to see open jobs at each company as well as who the hiring managers are so you can follow up with more information. This shows the number of times you came up in search results in a given week. I ran a test as soon as the tool was released, I checked my search appearances daily for a week and I found the number changed daily! I suspect LinkedIn is still working out the bugs of their new program so I will continue to check my stats several times a week. Initially, this seems like good data to help us tweak our profiles, but LinkedIn doesn’t explain what constitutes a weekly search appearance. For example, does someone need to type your name to come up in search results, or just a title? Also, the search appearances did not translate to “Who’s viewed my profile” which is the number you now see on the far left. That would be a significant benefit if it did. For now, I would perhaps use the data as a guide to tweaking my profile coupled with paying close attention to the companies that come up where the searchers work. I would also compare the “Who’s viewed my profile” people, titles of the searchers and companies to see if the data matches the search appearances. For example, if I were targeting business development titles in my own searches because they are my ideal client, should those titles be shown in the results I would know my profile is reaching those I want to reach. Another example, if I were seeking a job and recruiters were showing up in search results then I would know my profile is, in fact, hitting the right people. If you are seeking a new position, click through the companies where searchers work and onto their jobs tab. The clue here is to read the job descriptions and make note of the current employee insights, then view the skills shared. If you have those skills be sure you have them in your profile in these sections; headline, summary, experience section title, skills & endorsements, and recommendations. This will dramatically improve your chances of being found in a search. Although I don’t see this new feature’s data being perfect by any means, it does leave a trail of clues. Don’t be afraid to keep updating your profile utilizing the keywords that come up in this data.This is an area you should not leave to chance and should always be striving to perfect. LinkedIn’s algorithm is set-up to specific criteria and although we don’t know exactly what that is, LinkedIn gives US clues by the features they offer the user. As a free subscriber, you only have access to the current weeks’ data from “Who’s viewed your profile” so you want to be sure you are checking this stat daily for clues. If you have a premium account, you gain access to everyone who has viewed your profile in the previous 90 days. If you are in any type of a sales role, upgrading to Sales Navigator offers additional data particularly in search criteria. You also gain access to much more detailed information about a prospect. With now over 500 million members on LinkedIn it isn’t easy to stand out and get found. How you can stack your own deck is by keeping your profile updated and change keywords as you discover new insights. Study the data daily and weekly for the clues of who is finding you. Being proactive is reaching out to those people who do find you in search and talk with them about what they are looking for, did your profile offer them something that drew them to you – ask them what that was. 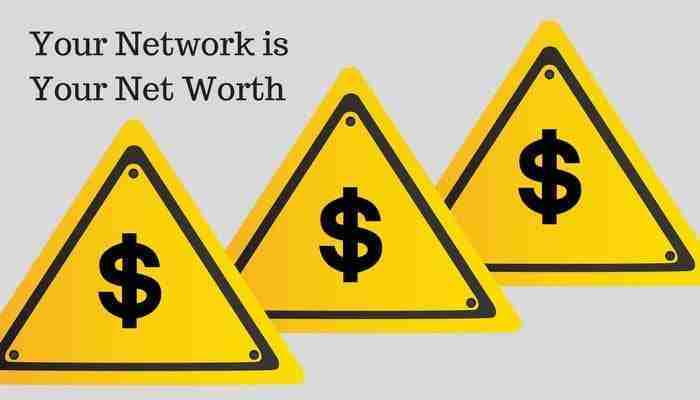 By taking a proactive approach to your network connections you will gain better results in being found, connecting with the right people and uncovering more opportunities. The search appearance feature is a tool in your arsenal that will provide you the clues and offer a competitive advantage.